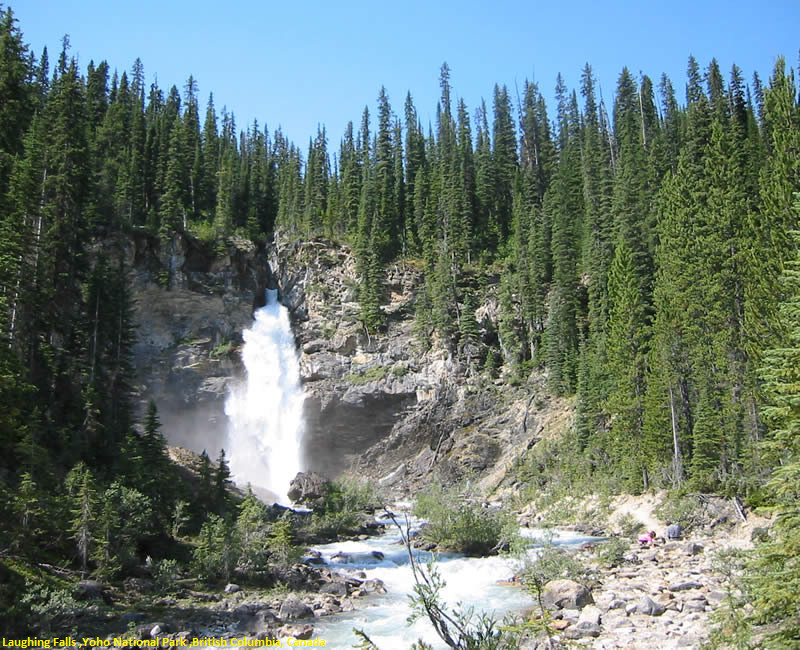 Laughing Falls is the major waterfall of the Little Yoho River as it plunges out of a modest hanging valley to meet the Yoho River on the floor of the valley. The river emerges from a very narrow slot canyon and explode outward in a forceful plunge of about 100 feet which sends up a constant, blinding wall of mist that is capable of producing immensely vibrant rainbows in the morning hours.The Laughing Falls backcountry campground provides the opportunity for hikers to fall asleep to the steady sound of the waterfall and churning river. Laughing Falls is found 4.2 kilometers along the Yoho Valley Trail from the end of the Yoho Valley Road at Takakkaw Falls. Best views of the falls are had by walking upstream towards the falls about 300 feet after crossing the bridge over the Little Yoho River.